For the last few years, couples made their special day unique by copying coordinated dance routines down the aisle and at the reception, after that one couple did it on YouTube. Now, there’s a whole new “unique” thing everyone is doing: Marryoke. 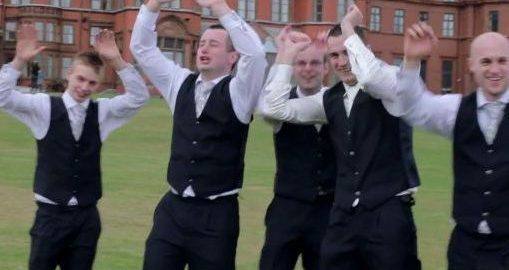 The trend began in the U.K., but has made its way over to our shores — so don’t be surprised if you’re asked to lip-synch to some Katy Perry at a wedding this summer. Wedding trends, like the coordinated dances to Justin Bieber and Chris Brown songs, spread like wildfire among brides looking for a way to distinguish their wedding day from all of the others. Videographers even offer special “Marryoke” services as part of their packages, now. What will a Marryoke video look like at the 50-year anniversary? Probably really cheesy — but if the couple makes it to 50 years still happily in love, it doesn’t matter.